Intel and Scalable Graphics have developed a solution to stream 3D applications with very high image quality and low latency, based on Intel® Iris™ Pro graphics and with it, Intel® Quick Sync Video. The solution can also take advantage of Intel® Processor Graphics on client side for even better experience. The stream density of some of the form factors Intel Iris Pro graphics is available in (for instance some of the ultra-dense Intel® Xeon® Processor E5 Family servers, or the Intel® Visual Compute Accelerator Card) allows CSPs to provide low latency cloud-based streaming services at a total cost of ownership (TCO) which is commercially attractive both to CSPs and their customers. 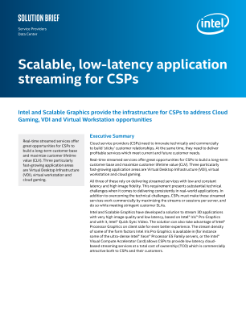 Using new Intel® Xeon® Scalable processors, VMware can drive more virtual machines and run more workloads in the data center. Les réseaux prêts pour le Cloud avec Intel Inside® sont définis par logiciel et s'intègrent de façon transparente afin de créer une expérience agile et évolutive. Le responsable de l'ingénierie de la Commonwealth Bank of Australia parle de la valeur d'une infrastructure définie par logiciel.